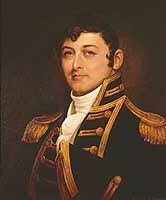 Isaac Hull was a Commodore in the United States Navy. He commanded several famous US naval ships including USS Constitution and saw service in the Quasi War, the Barbary Wars and the War of 1812. In the latter part of his career he was commander of the Washington Navy Yard, and later the Mediterranean Squadron.